I am so excited to talk about lemons as a Whole Plant–Whole Food. Lemons are produced on trees, as most of us know. They have beautiful evergreen leaves which have a distinct citrus scent, and intoxicating blossoms that smell like heaven. Honey made from citrus blossoms is among the best in the world. I, for one, feel amazingly blessed to have a lemon tree, which in itself, is a veritable pantry. When considering lemons, we usually only consider the fruit, and mainly the juice. But once you start thinking of it as a whole plant–whole food you are really looking at the whole tree. The leaves, the blossoms, the fruit, and the seeds. 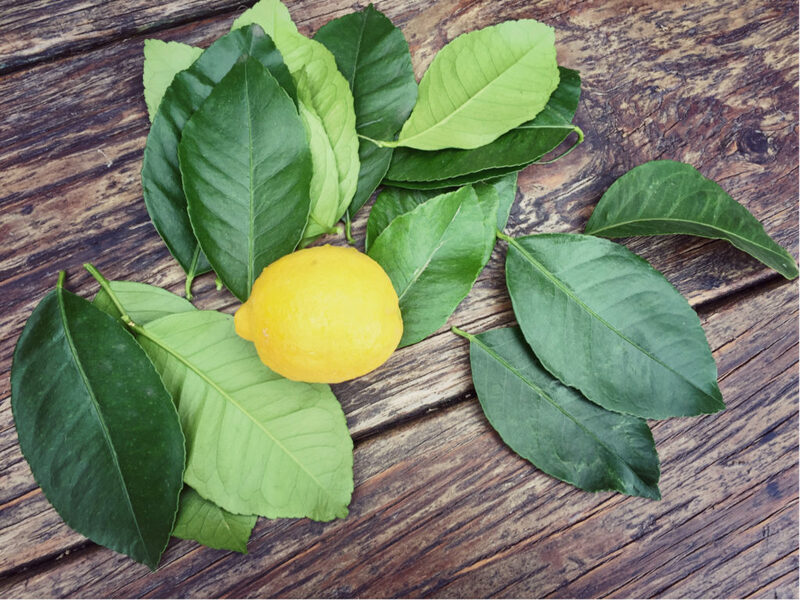 Mediterranean cultures that have developed with lemon trees are a prime resource for finding uses for the trees. 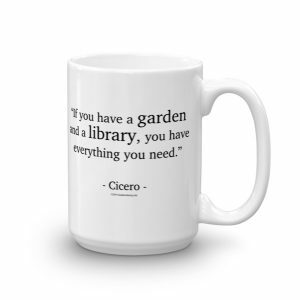 You can find culinary and medicinal recipes for every part of the plant. 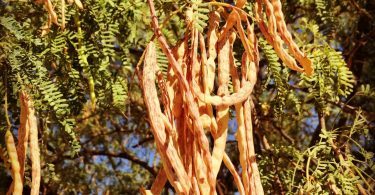 Looking at the nutritional benefits of those parts, you begin to have a new respect for this fantastic resource growing in your yard. 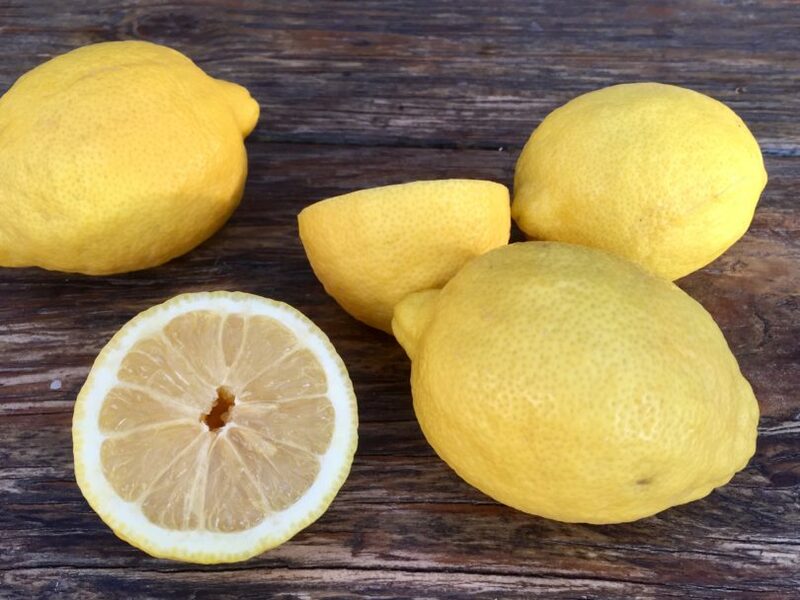 Every 100 grams of lemon peel has 134 milligrams of calcium. The same amount has 160 milligrams of potassium. The same amount contains 129 milligrams of vitamin C.
The same amount contains 10.6 grams of fiber. Caution: Lemon peel contains oxalates which can cause problems for those who suffer from gall or kidney stones. Lemon peel has also been proven to lower cholesterol according to study published in the US National Library of Medicine National Institutes of Health. It is the entire lemon peel, including the white spongy part that is beneficial. The yellow zest contains Vitamin C, but to get the maximum benefit you need to eat the white part too. Check out newhealthguide.org for more benefits. 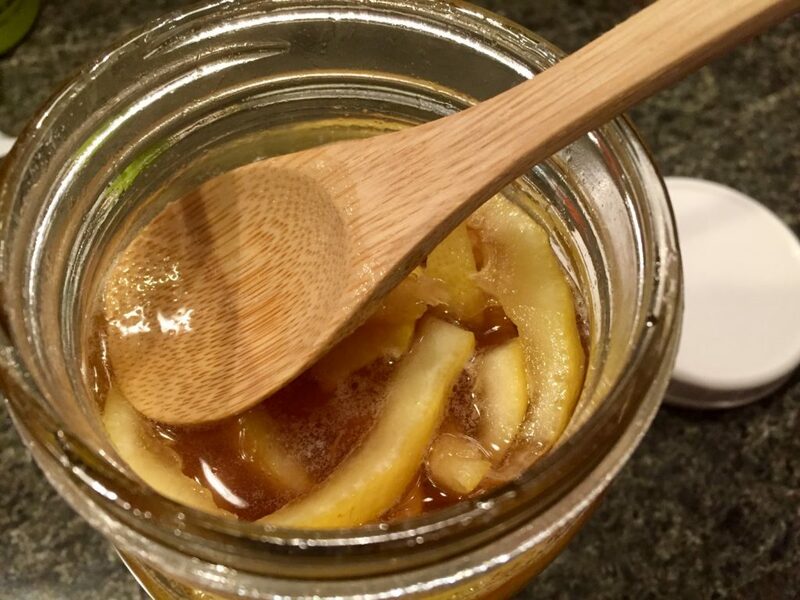 Don’t worry, you can make a delicious lemon-honey candy simply by placing lemon peel slices in a jar and pouring boiling honey over it. Keep this in a cupboard and eat a few pieces at a time. Yum! See the whole recipe here a YourFarmFoods. Lemon zest, which is the thin yellow layer on the outside of a lemon peel, is where the non-acidic flavor of lemon is found. Having a good lemon zester is a great help if you use lemons a lot. 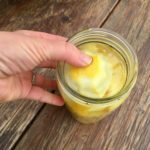 Using a potato peeler, remove the yellow portion of the peel from as many organically grown lemons as you can fit into a jar (the peels that is). Probably around 8-10 for a quart jar. 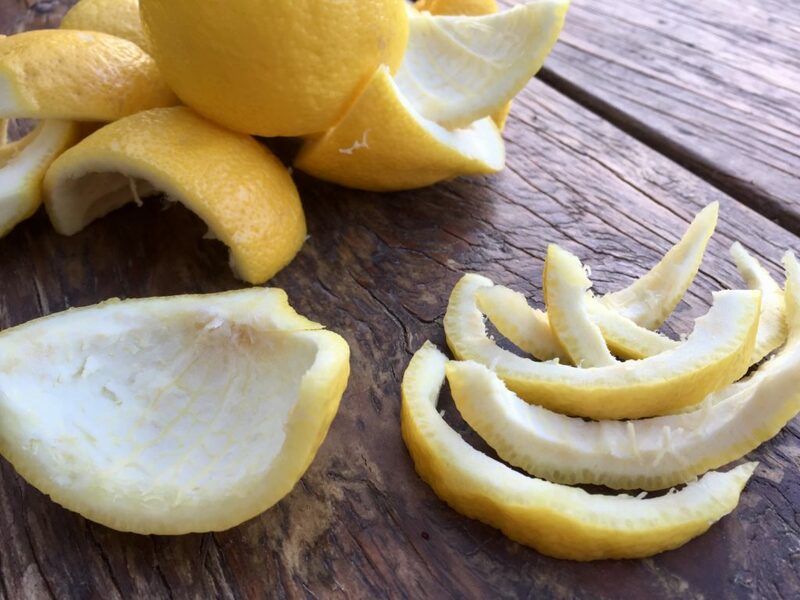 The more lemon peel you use, the stronger the lemon flavor. 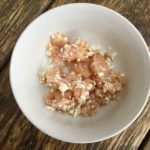 Use the white part of the lemon peel and any seeds to make pectic for jams and jellies with this recipe from Leda Meredith. Fill the jar with a 100 proof Vodka or Everclear. (Don’t be afraid of the high alcohol content, remember this is going to be diluted with syrup.) Let this steep for a week to a month or more. 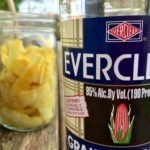 Everclear is 95% alcohol, as opposed to most 40% vodka. It does cost more though. use a lemon to press down on the peels to keep them submerged. Cover and let steep for a week or more. Strain the liquid into another jar, leaving all the peel in the strainer. This is now lemon-infused alcohol. You can keep it in this state and then just add a simple syrup each time you want to use it (not technically Limoncello but definitely more customizable as to sweetness). 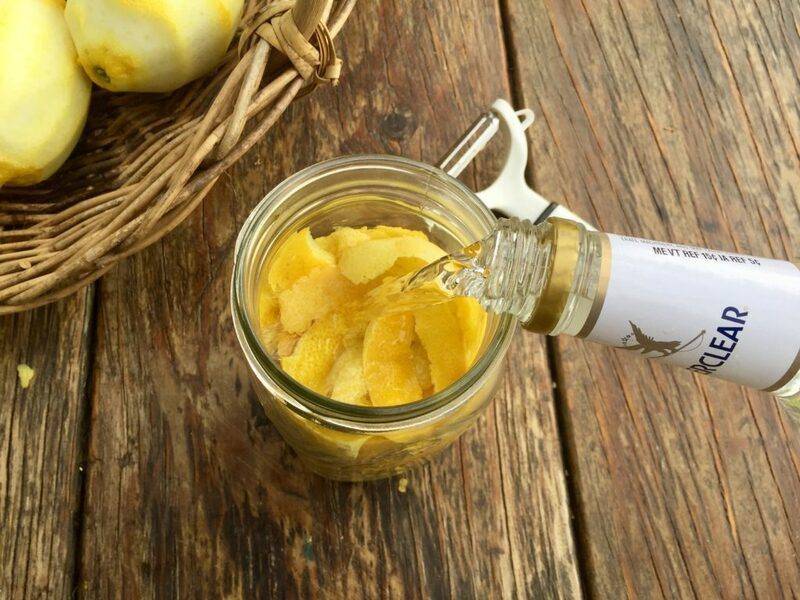 To finish making the Limoncello, make a simple syrup of 3 cups boiling water and 2 1/2 cups granulated sugar (you can add more or less sugar if you like). Let this mixture cool and add the lemon-infused alcohol. Pour into clean bottles to store before drinking or giving away. You can use it right away, but it gets better over time. 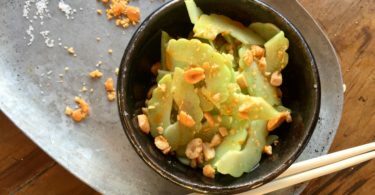 Try this technique with other citrus fruit for a different flavor. Lemons have been used for medicinal purposes for thousands of years. We all know the benefits of Vitamin C, but there is so much more to lemon juice. Check out this post from Organic Facts. When we were in Ireland a few years ago both my husband and I got sick. Being from Arizona we were not used to the cold, wet days and nights in Dingle. The owner of the local restaurant we frequented, The Stonehouse Restaurant, made us hot toddies with hot lemon juice, whiskey, and honey. It definitely warmed our insides. Memories! Where do you even start to compile a list of recipes for lemon juice? It is a staple of so many cuisines. And my favorite pasta recipe (coming soon). 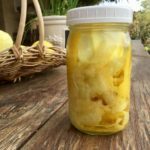 For those of us who live where lemon trees are abundant, here is a way to concentrate lemon juice to take up less space in the freezer. 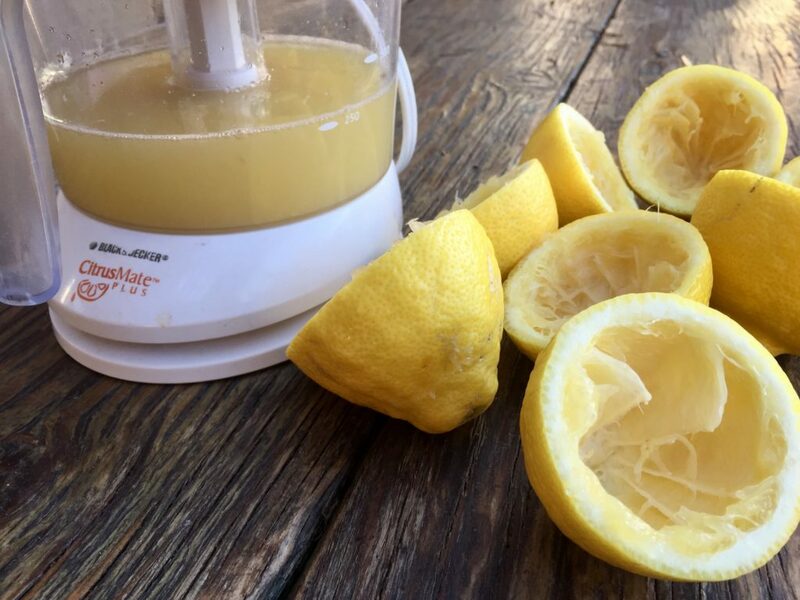 Juice your lemons and fill a clean gallon milk or water jug. Freeze for 24 hours or more. Remove the lid on the jug and prop the jug over a bowl at at slant or balanced over a funnel, so that the opening is in or over the bowl. Leave it alone for several hours to melt. The concentrated juice will drip out, leaving the frozen water in the jug. Then just refreeze the concentrate in a smaller container. You can repeat this for more of a concentrate if you like. I’m not sure of the nutritional analysis of lemon leaves, but from what I have read, they do contain vitamin C, and obviously chlorophyll, which is good for you in itself. There isn’t a great deal of information that I could find on the use of leave for medicinal purposes, but I did find this video from Dr. Paul Haider, master herbalist. He mentions that lemon leaf tea is useful for curing insomnia and for stress relief. 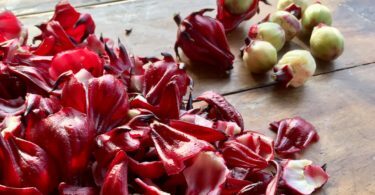 This blog post from ThymeToEmbraceHerbs.com also mentions that it is a remedy for insomnia, migraines, and asthma. The leaves have been used for tea in mediterranean cultures for centuries and is quite delicious if nothing else. 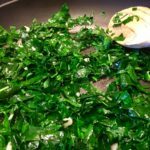 Lemon leaves can be used to flavor soups much like lemongrass, simply toss whole leaves in your broth as it cooks to impart a mild lemon flavor. 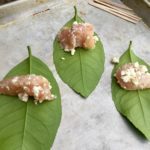 The main use for lemon leaves in cooking is as a wrap for baking or grilling foods. It beautifully imparts its lemon essence to whatever it surrounds. 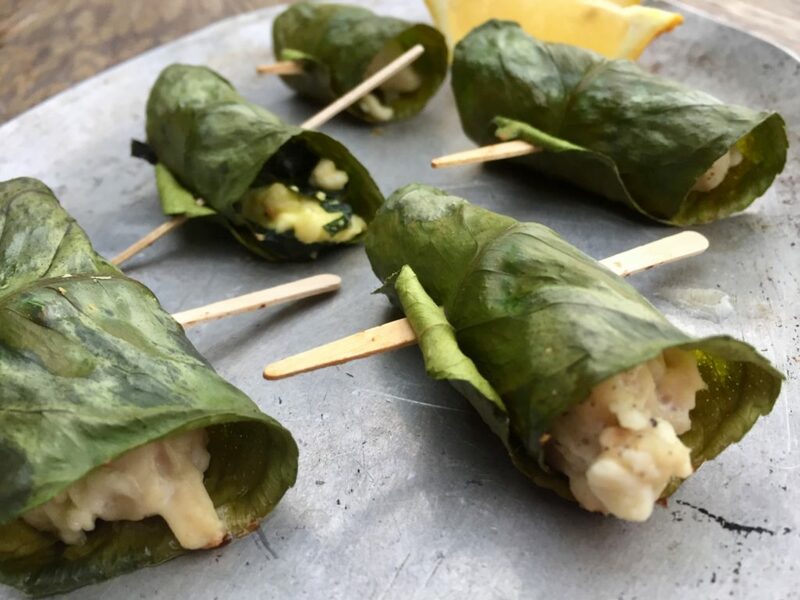 Lemon leaves infuse their lemony essence into anything they are wrapped around. This is actually two recipes that I wanted to try: chicken & feta wrapped in lemon leaves and a basic spanakopita filling using broccoli leaves, feta, garlic, and ricotta. I don’t know how the chicken tastes, but my husband said it is delicious. The broccoli leaf recipe is ok, but I think I need to tweak it a bit. 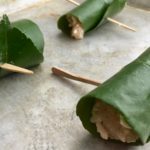 I encourage you to try wrapping all kinds of things with lemon leaves. 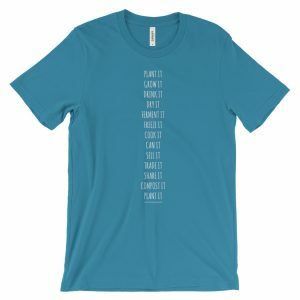 I bet fish would be great! Please let me know if you land on a great recipe. 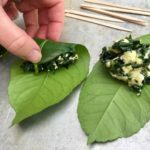 Place spoonful of mix at the stem end of the leaf and roll, securing with pick. Bake both wraps at 375 for 10-12 minutes. Unwrap and eat with a squeeze of fresh lemon juice. Discard the leaves rather than eating them. At this point I couldn’t find a nutritional analysis of lemon blossoms. 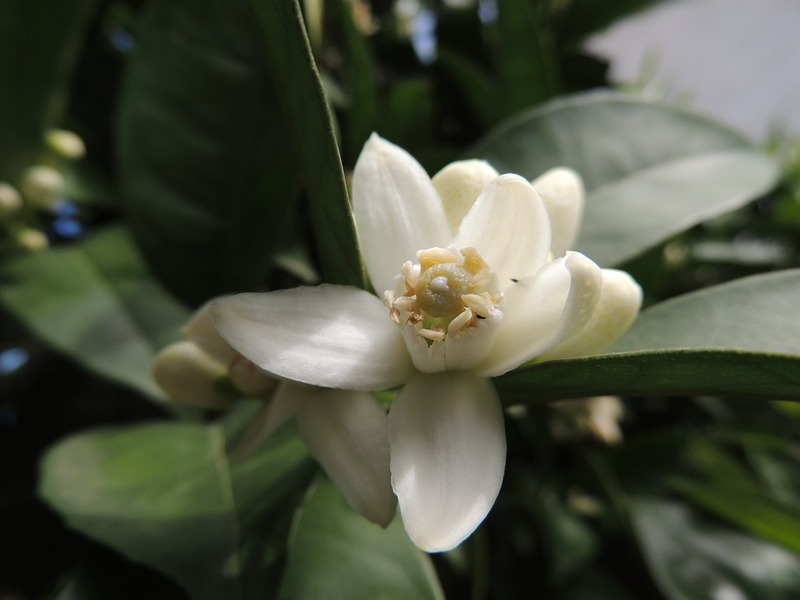 There are not many reports about the medicinal properties of lemon blossom. I did find some reference to the essential oil being used as a sedative for those suffering from anxiety or insomnia. This makes sense because the aroma is intoxicating. To extract the perfume for room or body sprays, you can make a tincture using alcohol like vodka or Everclear. Just fill a small jar with flowers and then alcohol. Cover tightly and let steep for a week or more. Strain and use or add more flowers for a stronger scent. Use a diffuser or spray bottle to apply. Lemon blossoms can be used to make a floral-scented tea by steeping them in hot, but not boiling water for 10 minutes. You can distill the essence of lemon blossoms at home with only a few tools that you probably have in your kitchen. 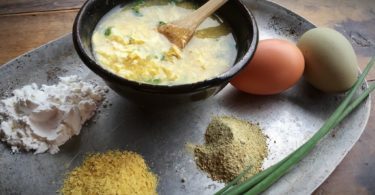 Check out this blog post from DandelionessHerbals.blogspot.com about how to do it. This produces a hydrosol (floral water) that can be used as a perfume or in recipes that call for rose or orange blossom water. I can’t wait to try this! I was unable to find a nutritional analysis for lemon seeds. 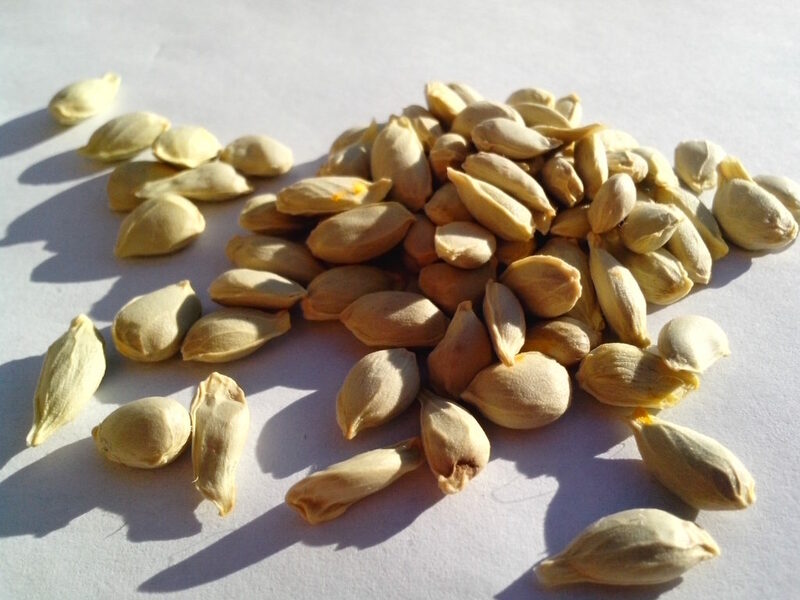 Lemon seeds can be used in making jams. Save your seeds in baggies in the freezer until you are ready to make jam. Then just tie them up in a tea bag or cheesecloth and pop them in the pot with your fruit as it cooks. It isn’t an exact recipe, so you’ll have to experiment. 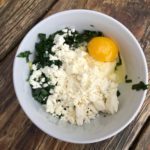 I found that great tip from TheKitchn.com. So how do you use lemons? 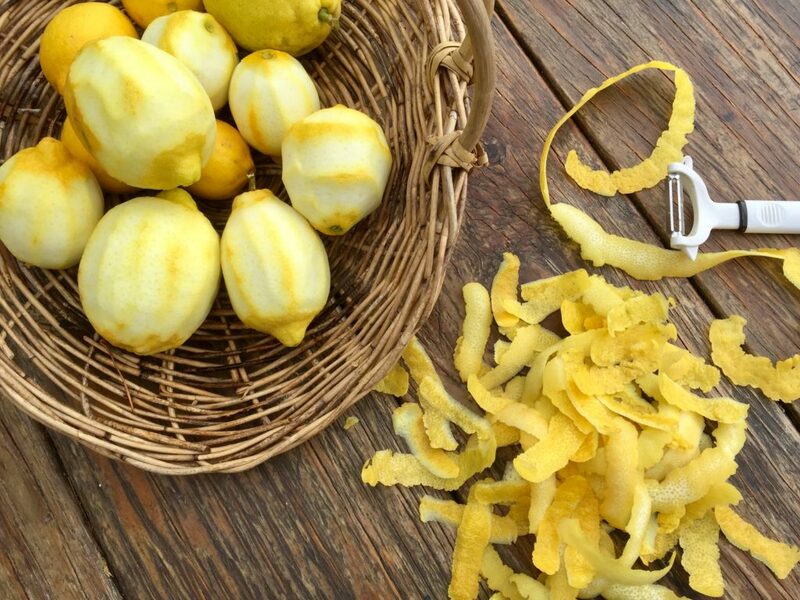 I’d love to add some more tips or recipes to my lemon repertoire. Thanks Kaye. That is a bummer about the leaf miners. Not much you can do about it either. The lemons are the best part anyway. And you can also use the blossoms when they arrive. Enjoy!